If you will look at actress Iza Calzado’s former house in Quezon City and the condo unit she lives in now, it’s easy to spot a few similarities. Both havens showcase a mix of modern must-haves, captivating accent pieces, and an envy-worthy sophisticated feel. To achieve the look she wanted for her unit, Iza worked with interior decorator Nix Alanon and the FTADesign Team. 1. 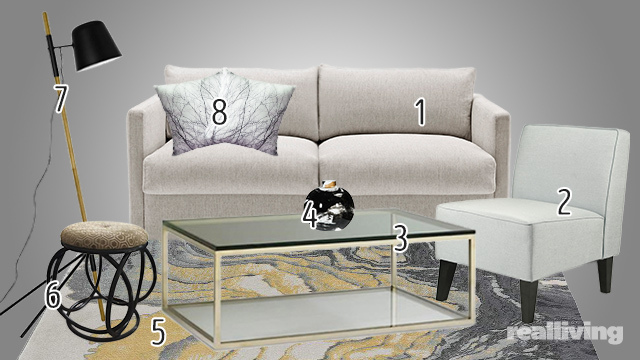 This comfy, beige-gray sofa is timeless and modern at the same time. 2. Pair a sleek sofa with an equally elegant armchair—this one comes in a compact size, perfect for condos. 3. This simple but classy coffee table comes with storage space for books and magazines. 4. Arrange a couple of different-sized ceramics on the coffee table for an artful vignette. 5. Decoliving’s dramatic, geode-patterned area rug is a true statement piece. 6. Balance out a couple of armchairs with a pair of retro-style stools. 7. Throw in an industrial-style floor lamp to shake up things. 8. Add soft pillows with a sudbued, earthy pattern. See more photos of Iza Calzado's modern eclectic condo unit in YES! Magazine's May 2017 issue—out now in bookstores and newsstands nationwide. You can also download a digital copy of YES! Magazine when you log on to Summit Newsstand at http://summitnewsstand.com.ph/yes-magazine.